Thanks for the HDMIs and TOSLINK, the products are awesome, great price and fast delivery too. Cheers. High-End 8-Way Ultra HD 4K/60Hz HDMI Splitter with EDID Control (1x8 HDMI 2.0 Splitter) + FREE SHIPPING! Duplicate a single HDMI source device to show on up to eight displays at once. Supports HDMI 2.0 specification hardware on all inputs and outputs, for 4K Ultra HD @ 60Hz resolutions,HDR, 4:4:4, 3D and Dolby True HD Audio. 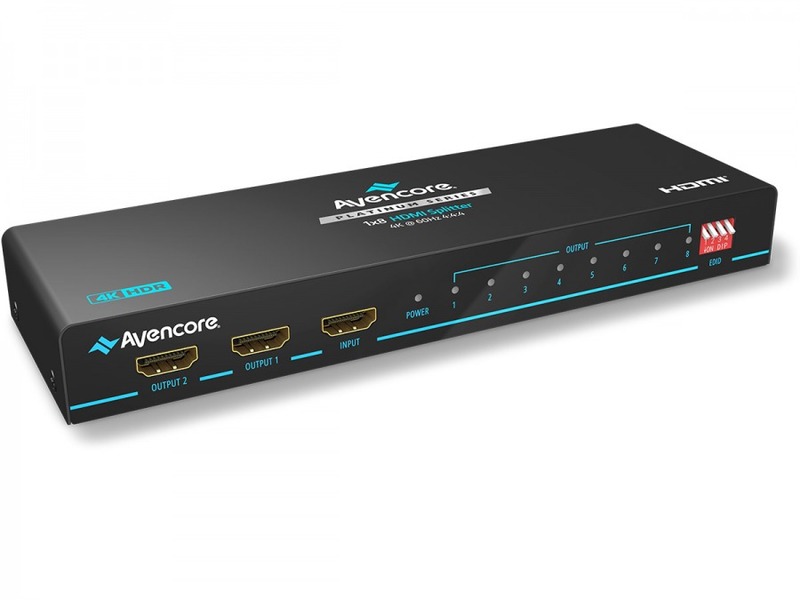 This Premium 4K "1x8" HDMI Splitter from is ready to duplicate your 4K content and deliver it to up to eight connected displays. 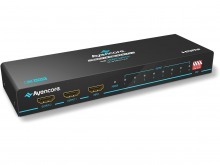 This gives you the freedom of showing the same great ultra-high-fidelity content on any combination of 4K televisions, projectors or computer monitors at the same time - all from the same source device! Enhanced EDID Control offers user-selectable options via the bank of dip-switches, allowing you to select from a wide range of preconfigured resolutions and audio formats to ensure that all connected displays receive exactly the same signal, regardless of differences between specification or brand. A great feature for office and commercial installations. Suitable for use with 4K Blu-ray players, games consoles and computers, this unit is fully powered to boost HDMI signals and allow it to go further than any single cable can manage. HDMI up to 2160p (4K) Ultra HD @ 60Hz (4:4:4), HDR, 1080p and Blu-ray 3D are all supported, as well as many other HDMI v2.0 features such as deep colour and more (hardware must also be compatible with these HDMI features). For 4K content, Cable Chick recommend using the shortest, high-quality cables possible. Cables under 5 metres (on both sides of the splitter) will have the best chance of supporting all HDMI features and resolutions. Did you know Cable Chick also stock Cables & Accessories for Cars? Back Order for 2nd Week of May Dispatch! When pre-ordering, you can select at the checkout to have your order part-shipped, or shipped together when all items are in stock. Hi Crew, Just a quick note to let you know that I wish to thank you all for your friendly service and great prices. I always tell my friends to look you guys up for bargains. Thanks again for you friendly service. Did you know Cable Chick also stock Good Quality Headphones?